What is Neroli Oil ? 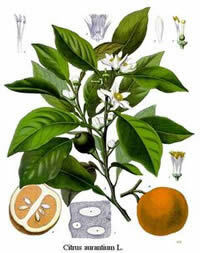 Neroli essential oil is pale yellow in color (yet will darken with age), and is steam distilled from the flowers of the bitter orange tree. It has a lovely floral scent that is enjoyed in perfumery. Its aroma is classified as a middle note, yet it can vary from a base or top note depending on what other oils it is mixed with. It is an expensive oil because it takes a lot of blossoms to produce it. Even so, it is usually used in smaller amounts due to its richness. Neroli has sedative properties, and is effective for calming anxiety and to promote a relaxing environment. It is also an aphrodisiac and an anti-inflammatory. It blends well with coriander, geranium, clary sage, rose, frankincense, ylang-ylang, and citrus oils. Neroli is a wonderful addition to a relaxing bath, or after-bath oils. Used in a diffuser or aroma lamp, and blended with lemon and bergamot, Neroli sets the air with a light, but highly fragrant orange blossom blend that is so inviting and refreshing. Botanical Information - Rituals & History : The bitter orange tree is native to China, now grown in Egypt, Sicily, and the South of France. The Neroli white blossoms are small and highly aromatic.